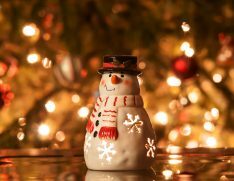 We will be taking our annual Christmas break and will be closed from Tuesday 27th November until Thursday 27th December. We will be back open on the 27th December until Sunday 6th January. May we take this opportunity to wish our all our lovely customers a very Merry Christmas. We look forward to seeing you all in the new year. 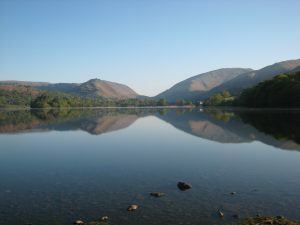 Known for its beautfiul walks and breath – taking landscapes the Lake District is also famous for its connections with lake poet William Wordsworth. 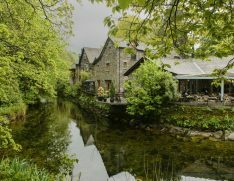 His connections to the lakes can be found in the bustling village of Grasmere. Below are some attractions and points of interest located in or near Grasmere which were part of Wordsworth’s life. William Wordsworth was born on 7th April 1770 in a fine Georgian house known today as Wordsworth House. William lived in the house with his father, three brothers and younger sister Dorothy. The house today has been turned into a National Trust tourist attraction where visitors can step back in time to William’s childhood home. 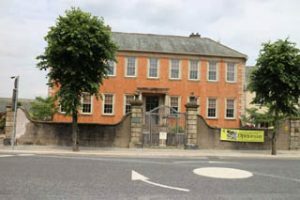 The first home of William Wordsworth and his sister Dorothy between 1799 - 1808. Dorothy become William’s secretary to enable the poet to pursue and dedicate his life to poetry. In 1802 William married his childhood sweetheart Mary Hutchinson and the first of their five children were born. As the family grew Wordsworth moved to Allan Bank in 1808. Here they lived for two years, a large house that William had condemned as ugly when it was being built. 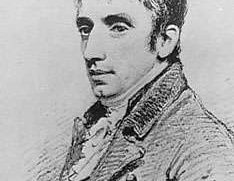 While living in Allan Bank Wordsworth and his family also lived with Samuel Taylor Coleridge and Mary’s sister Sarah. Things soon became crowded and soot from the chimneys kept getting on the furniture. 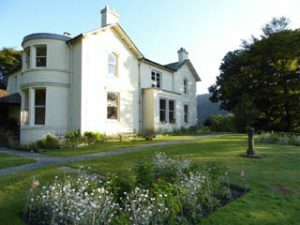 In 1811 the family moved to The Old Rectory in Grasmere. 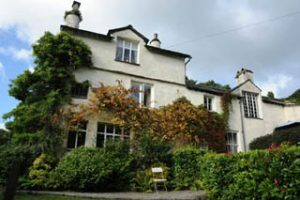 Wordsworth moved to Rydal Mount in 1813 after his two youngest children died while living in The Old Rectory. William and Mary stayed at the house until their deaths in 1850 and 1859. Whilst living at Rydal Mount William became Distributor of Stamps for Westmorland with an office in Church Street in Ambleside. In 1820 he published his ‘Guide through the District of the Lakes’ and became the Poet Laureate. St Oswald’s Church is where William and his wife are buried. Wordsworth wrote over 70,000 lines of verse which is 40,000 lines more than any other poet. One of his most famous poems is ‘I wandered lonely as a cloud’. The poem is commonly known as “Daffodils” and explores the poet’s relationship with nature, and how the memory of the daffodils dancing comforts him whenever he recalls them. Known for its beautiful walks and breath – taking landscapes the Lake District is also famous for its connections with lake poet William Wordsworth. 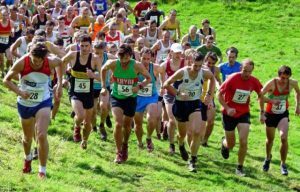 His connections to the lakes can be found in the bustling village of Grasmere. 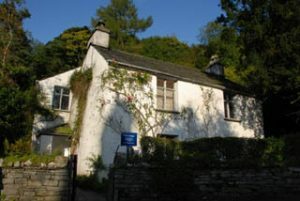 William Wordsworth was born on 7th April 1770 in a fine Georgian house in Cockermouth, which is now known as Wordsworth House. William was one of four children with two brothers and sister Dorothy. Much of William’s childhood was spent in Cockermouth and Penrith where he attended infant school. Attending infant school with William was his soon to be wife Mary Hutchinson. 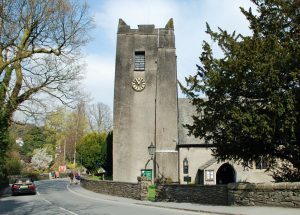 William attended the Grammar School in Hawkshead, where he received encouragement from his headmaster to read and write poetry. During this time, he made regular visits to the countryside to gather inspiration from nature. Pursing his career in poetry he attended St. Johns College in Cambridge, where he received a bequest of £900. This gave him the means to pursue his chosen career. In 1797 the Wordsworths stayed in Alfoxden House, where they met Samuel Taylor Coleridge and Robert Southey. In the years to follow a relationship between William and Coleridge grew. 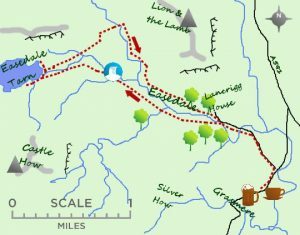 Soon after William and Coleridge undertook a tour of the lakes, starting at Temple Sowerby and finishing at Wasdale Head, via Grasmere. 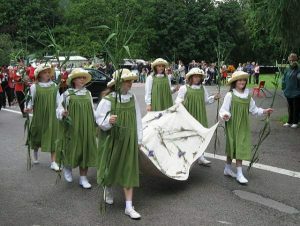 While in Grasmere they noticed Dove Cottage and an empty Inn called the Dove and Olive Branch. Shortly after William and Dorothy moved into Dove Cottage, where they lived for the next nine years. Dorothy became William’s secretary as William dedicated his career and life to poetry. In 1802 William married Mary Hutchinson, and the first of their five children were born shortly after. 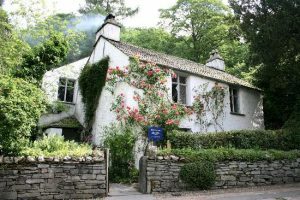 The family outgrew Dove Cottage, so they moved to Allan Bank for two years, and then on to Rydal Mount. William died in 1850 and Marty in 1859. 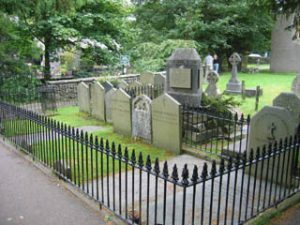 Both William and Mary’s tombstones can be found in the churchyard of St. Oswald’s Church in the centre of Grasmere. Wordsworth wrote over 70,000 lines of verse which is more than 40,000 lines more than any other poet. One of his most famous poems is ‘I wondered lonely as a cloud’. The poem is commongly known as daffodils and explores the poet’s friendship with nature, and how the memory of daffodils dancing cheers him up whenever he recalls them. Other poems include ‘Composed under Westminster Bridge’, ‘London 1802’, and ‘Tintern Abbey’. Most of Wandsworth’s connections to Grasmere such as Dove cottage, Allan Bank, and Wordsworth House have been turned into museums or a National Trust attraction. Feel free to explore them on your next visit to the lakes, where you will find links for them below. Take in the stunning views of the Langdale Pikes with a walk to Loughrigg Tarn. On route to Loughrigg Tarn you will come across the other side of Loughrigg Fell. 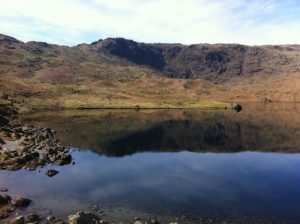 The walk has some stunning views of The Langdale Pikes, Helm Crag, Windermere and Rydal Caves. The Langdale Pikes can be seen within the surrounding hills of Langdale. Loved by walkers and Alfred Wainwright the Pikes include Pavey Ark, Thunacar Knot, Pike of Stickle and Harrison Stickle. 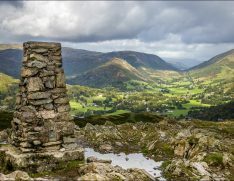 Helm Crag is situated to the north of Grasmere and is perfect for those who enjoy a shorter walk. The rocks on the summit have various names “The Lion and Lamb”, “The Howitzer” or “The Old Lady Playing the Organ”. Rydal Caves are situated on Loughrigg Fell and are a man-made cavern which was known as Loughrigg Quarry. Over a hundred years ago the caves were a busy working quarry supplying high quality roofing slates to the people in the village. 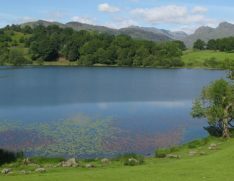 As well as being loved by those visiting or living in the lakes Loughrigg Tarn was a favoured place of the poet William Wordsworth. Located in the beautiful Lake District we are lucky to be surrounded by a number of breath-taking walks such as Loughrigg Fell. Loughrigg Fell is on the outskirts of Ambleside and is a perfect walk for superb views over Grasmere and Rydal water. The fell is surrounded by open water and the River Rothay can be seen to the north. 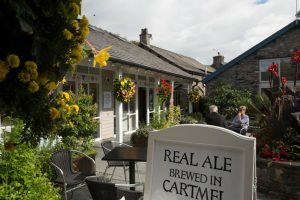 Starting in the popular town of Ambleside the walk takes you over the top of Loughrigg Fell, along the airy Loughrigg Terrace and the permissive path to Rydal Cave. Rydal Cave is a man made quarry which is known for its’s high quality roofing slates in the 19thcentury. The cave today is visited frequently by walkers who are advised to take care as in recent years rocks have started to fall from the ceiling. Over two hundred years ago the cave was a busy quarry known as Loughrigg Quarry. 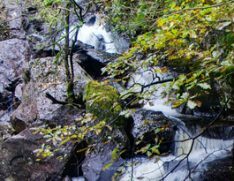 Take in the sounds of a cascading waterfall with a walk to Launchy Gill waterfall. This is short walk to the waterfalls of Launchy Gill on the west side of Thirlmere reservoir. Thirlmere reservoir is home to Thirlmere lake which was originally two small lakes after it was purchased in 1889. Since then the area has had a dam which has led Thirlmere to become one vast resovior. In the process the settlements of Armboth and Wythburn were submerged with only one building remaining. The best time to see Launchy Gill is after a heavy down pour of rain where the water cascades down the waterfall. Although do take care as the stones and path can become slippery in wet conditions. In more calm conditions the waterfall and the surrounding landscape would be a good place to explore. Just after the bridge higher on the hill side is an interesting looking boulder that is known as ‘The Tottling Stone’. The stone stands out from the tress and is well known to those who visit Thirlmere and its reservoir. Located in the beautiful Lake District we are lucky to be surrounded by a number of breath-taking walks such as Alcock Tarn. A short and steep walk the tarn is located high above the fells. The tarn lies behind a small crag called Grey Crag perched on the other side of Grasmere. While walking in the fells it isn’t unusual to come across crags. Alcock tarn is just 2m deep which is shallow compared to other tarns within the lakes. 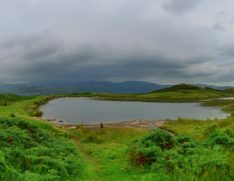 Originally known as Butter Crags Tarn it was enlarged in Victorian times by Mr Alcock of Hollins in Grasmere who stocked the tarn with brown trout. Getting to Alcock Tarn can be difficult in some places but worthwhile when reaching the summit. 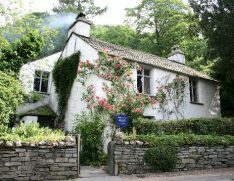 The walk passes some stunning views and landmarks such as The Wordsworth Trust Shop and Dove Cottage. 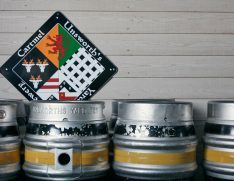 Both the shop and the cottage are dedicated to the life and work of poet William Wordsworth. Why does our vegan ice cream taste so good? Love our vegan ice cream, ever wondered why it tastes so good? 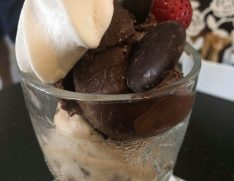 Our customers love our vegan ice cream which has become a popular dessert here at Greens. Our philosophy is that anyone can enjoy vegan food, so we take pride in ensuring our vegan offerings are delicious and tasty. 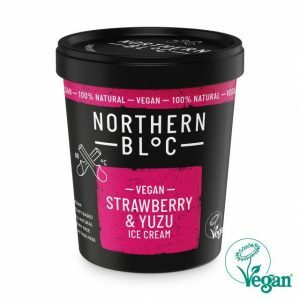 Our vegan ice cream comes from Northern Bloc who only use natural ingredients and abstain from using any animal products. Choose from our four flavours chocolate and orange, strawberry and yuzu, Madagascan vanilla or hazelnut and rose. Enjoy your choice of flavours in an vegan ice cream cone or in a Greens vegan ice cream sundae. 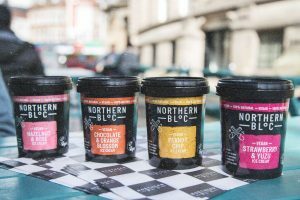 Northern Bloc only use natural ingredients in their ice cream. 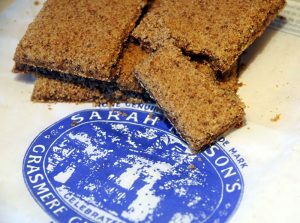 They believe that having a dietary requirement shouldn’t mean you have to compromise on taste or quality. 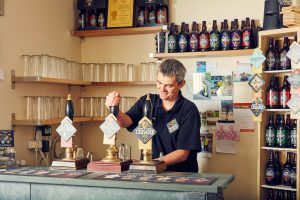 Using traditional flavours while adding a modern twist, Northern Bloc are always staying true to the principal of using the best natural ingredients. They take great care in responsibly sourcing the best natural ingredients for their ice cream. 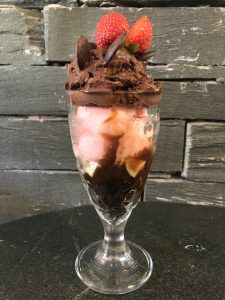 Abstaining from using additives, colourings, emulsifiers or artificial flavourings their ice cream is suitable for those with a gluten free, vegetarian and vegan diet. This is seen in the ingredients used in the flavours listed above. For example Strawberry and Yuzu contains ingredients such as water, strawberry puree, sugar and rice syrup. 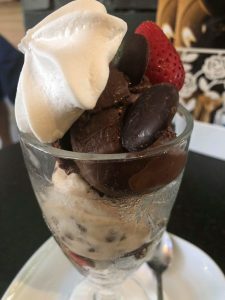 Using a modern recipe developed by their chef for over ten years their ice creams and sorbets are super smooth and ready to scoop straight out of the freezer. Their vegan ice cream range is great tasting with indulgent textures and only uses responsibly - sourced and natural ingredients. Their new vegan range embodies everything their core range stands for; great tasting, indulgent textures and bold flavours using only responsibly - sourced, natural ingredients, never anything artificial. 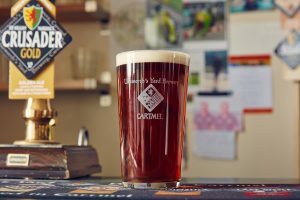 Don’t just take our word for it why not pop in and give it a try. We look forward to seeing you on your next visit.